Kevin McKrell has been a founding member of some very popular bands. First and foremost Celtic group Donnybrook Fair, and his namesake band, Celtic Bluegrass band The McKrells . This singer/ songerwriter has appeared on the stage of Carnegie Hall to standing ovations, and has shared other stages with the Furey Brothers, The Battlefield Band, Altan, Mary Black, Solas, Travis Tritt, Lonestar, Allison Krause, Sam Bush, to name a few. He has performed at some of the top Irish, Bluegrass and Folk Festivals including The Milwaukee Irish Festival, Irish 2000, East Durham Irish Festival , The Detroit Irish Festival , The Savannah GA. Irish Festival , The Slainte Irish festival, The Brooklyn Irish Festival, The Great American Irish Festival, The Leeds Irish festival The North Texas Irish Festival ,The Celebration of Celts, The Buffalo Irish Festival ,The Syracuse Irish Festival ,The Rochester Irish Festival ,Winterhawk Bluegrass Festival , Falcon Ridge Folk Festival, Colorscape Festival of Music and Art. The Towne Crier, Godfrey Daniels The Parting Glass,The Shannon Pub, Caffe Lena. 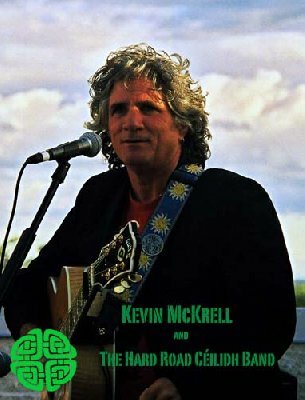 In Ireland Kevin has performed at The Kilworth Arts Center, The Midleton Folk Club, De Barras in Clonakilty, Matt Molloys in Westport ,The Square Pint in Kenmare. His musical talents have been showcased all over the U.S. and Ireland. His songs have been recorded and performed by many groups, including Irish favorites The Furey Brothers and Seamus Kennedy, Scottish favorites North Sea Gas, Irish American favs Hair of the Dog , Pat McKernan from Australia and most recently folk giants The Kingston Trio. Kevin is also a portrait painter whose work can be seen on his website and a writer he is currently working on a book about growing up Catholic excerpts from the book are also on this site. Katie McKrell first took the stage at 5 years old and wowed the house with a spectacular version of The Rattlin' Bog.. She has been writing songs and performing ever since. An accomplished and insightful songwriter, witty engaging performer and dead on harmony singer. With her father Kevin McKrell or on her own she is a force.